It's nothing new to control LEDs through Pi's GPIO, a lot of tutorials & resources are available on the Internet now. But I tried to do it myself too for the sake of testing the GPI output functionality. First I want to remind the readers that I'm not a hardware guy so this article may contains some mistakes, and if you find that, please leave comments to tell me, thanks in advance. 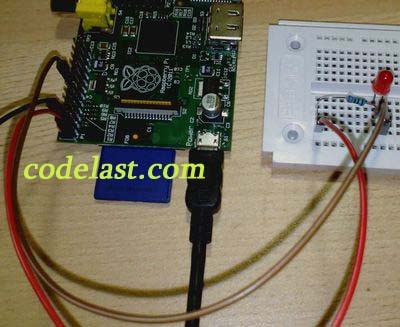 Write a simple program to control the GPIO on Pi to output high or low level to make the LED which connected to GPIO blink. 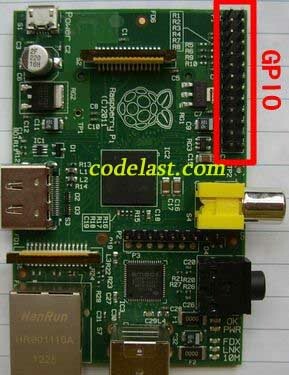 General Purpose Input/Output (GPIO) is a generic pin on a chip whose behavior (including whether it is an input or output pin) can be controlled (programmed) through software. GPIO pins have no special purpose defined, and go unused by default. The idea is that sometimes the system integrator building a full system that uses the chip might find it useful to have a handful of additional digital control lines, and having these available from the chip can save the hassle of having to arrange additional circuitry to provide them. You should pay special attention to that although most of what you found in the Internet are the pinouts like the first two images, it actually exists two kinds of names and the last image provides a comparison to them. But, there is a problem here: how can I know the sequence of the pins? That is, which one is 1, and which one is 2, etc. 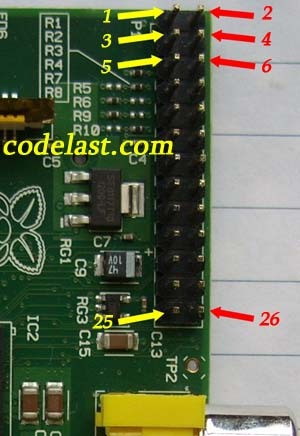 I ask a engineer friend of mine and he told me a method to identify the sequence of the pins: on the reverse side of Pi's circuit board, check which weld point of the 26 pins has a square shape, and the one who has is just pin "1", and the one next to it in the same row(each row has 2 pins) is pin "2", and so forth. 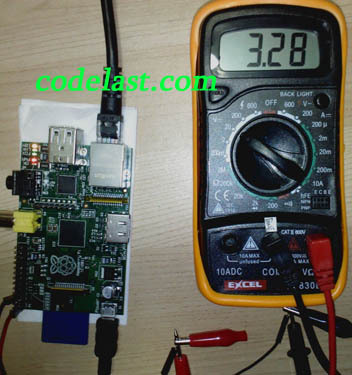 And for safty reason we should use a multimeter to have a test: turn Pi's power on, and connect the "+" of the multimeter to the "1"(3.3V) we consider is, "-" to the "6"(GROUND) we consider is, then the multimeter should display a approximate +3.3V. If it's not, then we made a wrong judgement on the pin sequence and should go back to check again! By the way, there is a very helpful tutorial on using GPIO on Youtube, you can have a look. Even it's such a simple circuit diagram, people who have given their analog circuit knowledge back to their teacher like me may ask that whether the output current of Pi can drive the LED, so I made some investigation... First, from this link I know that the 3.3V pin can output a max 50mA current, and from this link I realize that we should limit the output current of each pin to less than 10mA. Second, I get the info that the current to drive a LED is about 5~20mA, so the current provided by Pi is enough to drive it. Suppose the current is 10mA, we can calculate that the resistance is 3.3V/0.01A=330Ω, and consider that the forward resistance of a working LED is about a few tens of to hundreds of ohms, it's appropriate to connect a 270Ω resistance in series. By the way, I used Fritzing(an excellent open-source software) to draw the above circuit diagram and thank for the contribution of the developers! After the wiring is done, it seems that as long as we use a program to control GPIO 23 to output high/low level, we'll make the LED blink. So how to write such a program? I decide to use C to write the program. Thanks to @drogon that he provide all the Pi users a very good library: WiringPi, and by using the lib we can easily control the GPIO. So the installation is done. Note that once you use function digitalWrite() to set a pin to high level, as long as you don't set it to low level, it will be kept in high level all the time. Will see that the LED start to blink shown as this Youtube video. 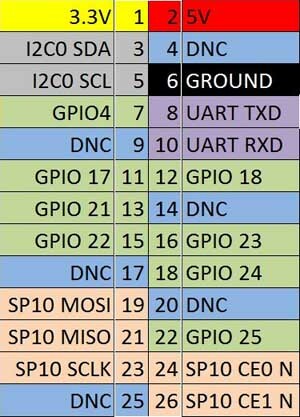 Here we give an argument 4 to the program and it represents the GPIO number which you want to set to high level. Why it's 4? 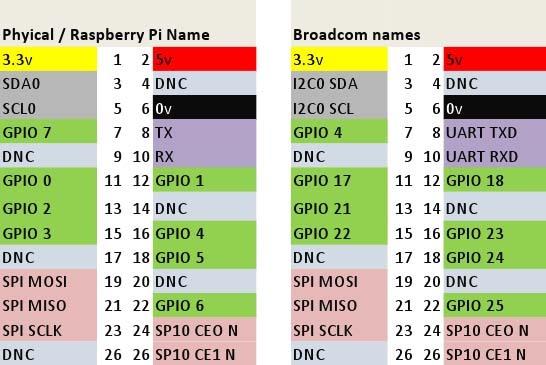 We've said that Pi has two kinds of GPIO pinout names, one is Raspberry Pi, another is Broadcom. 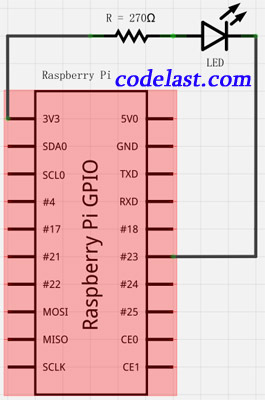 When using WiringPi library we should refer to the first one so it is GPIO 4 to correspond to the GPIO 23 of Broadcom way. So we must use 4 as the argument.